Subtitled in English, French and Norwegian. We ship everywhere except USA and Canada. Check amount in your currency with currency converter here. What makes someone want to blow themselves up for a cause? In this intimate and personal portrait from Sri Lanka we join two young female elite soldiers trained for the ultimate mission. We share their childhood experiences, their dreams and their families’ loss. Left behind are the mothers. Winner of Best Documentary at Message to Man International Film Festival in St Petersburg. Winner of Best TV-Documentary of the Year "Gullruten" in Norway 2009. (we ship everywhere except USA and Canada): All prices in Norwegian Kroner (100 NOK equals about 11.5 Euro). Pay with Paypal. 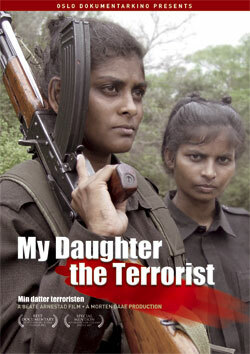 Synopsis: This documentary film is unique in its access to the lives and minds of two young girls in Sri Lanka who have committed themselves to the Black Tigers: the elite troops of the Tamil Tigers LTTE, dedicated to guerrilla attacks using martyrs. The girls know they will sacrifice their lives for the cause. Dharsika and Puhalchudar belong to the last batch of the Black Tigers, and are now equipped for the last mission: strapping an American-made Claymore mine to their bodies, able to blow themselves and everything within 100 feet to pieces. The girls have a close friendship. For seven years they have been eating, sleeping, training and fighting side by side. We meet Dharsika's mother, who has been struggling to bring up her family in a war-torn society. She tells us that Dharsika stayed with the family just long enough to bury her father, then disappeared into the guerilla’s hands. Sri Lanka is a country of great relevance for Norwegian foreign policy, but one which gets minimal coverage in the main media. This film gives a truely unique view of the conflict and an insight of the powers that drive those prepared to sacrifice everything for their cause.